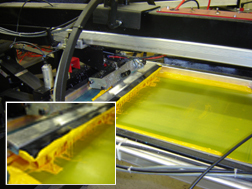 Screen printing ink is applied to the substrate by placing the screen over the material. Ink with a paint-like consistency is placed onto the top of the screen. It is then forced through the fine mesh openings using a squeegee that is drawn across the screen, applying pressure and thereby forcing the ink through the open areas of the screen. Ink will pass through only in areas where no stencil is applied, thus forming an image on the printing substrate. The diameter of the threads and the thread count of the mesh will determine how much ink is deposited onto the substrates. 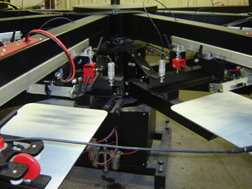 Generally the printed product will be placed on a conveyor belt which carries the item into the drying oven or through the UV curing system. In many cases the rotary screen presses will feed the material through the drying or curing system automatically. Once your order has been processed and packaged it is brought to the front office. An invoice will be created and you will be called to inform you that your order is ready. Unless prior arrangements have been made with the business office you will pay for your order when you pick it up. 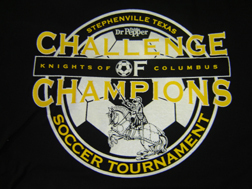 We DO ask that if you are collecting money for a group or organization that you make one payment to Specialty Cap & T-Shirt. You may pay with check, cash, MasterCard, Visa or Discover.